The $8M-capped, junior explorer Black Rock Mining (ASX: BKT) is currently drilling for high grade graphite in Tanzania – a world class region for graphite resources. Attempting to follow in the footsteps of another Tanzanian graphite explorer Magnis Resources (ASX: MNS), now capped at $145M, there is every chance the currently overlooked BKT may be in for a re-rate over the coming weeks. BKT is actively exploring for graphite in the Mahenge Project – next door to $31M capped Kibaran Resources’ (ASX: KNL) graphite orebody – which holds 2,194,600 tonnes of contained graphite. 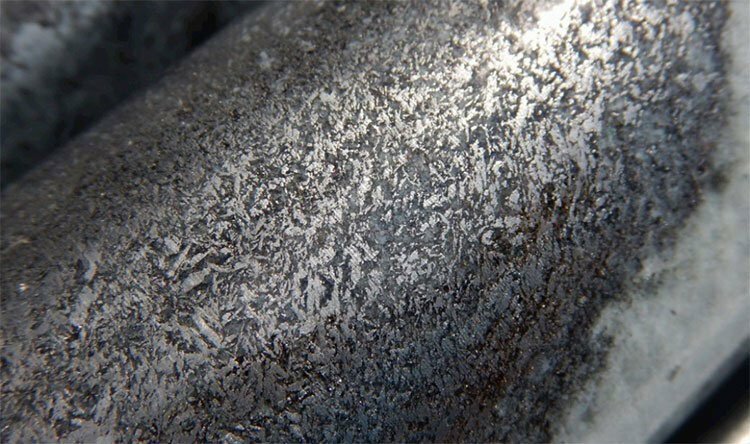 BKT’S direct neighbour Kibaran has already sealed a 10 year offtake agreement with German ThyssenKrupp for a minimum sale of 20,000 tonnes per annum of refactory grade natural graphite. Within BKT’s Mahenge Project lie two compelling graphite prospects being drilled into right now – the Cascade Prospect and the Ulzani Prospect – and each one has the potential for a standalone graphite resource. The company is also defining a JORC resource at a third prospect – Epanko North, which is due by the end of the year. However current investor focus is all on Cascade and Ulzani and what the drill bit might bring. 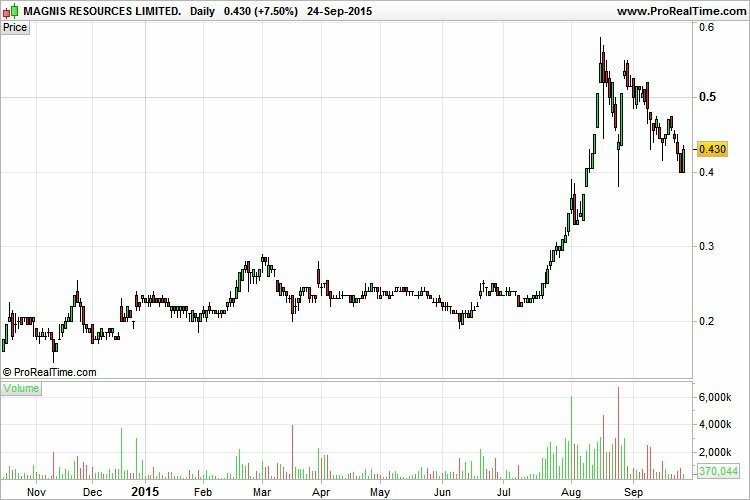 Any significant graphite strikes over the coming weeks have the potential to re-rate this stock immediately. However there is no guarantee of success here, and investors should seek professional advice before choosing to invest in BKT. 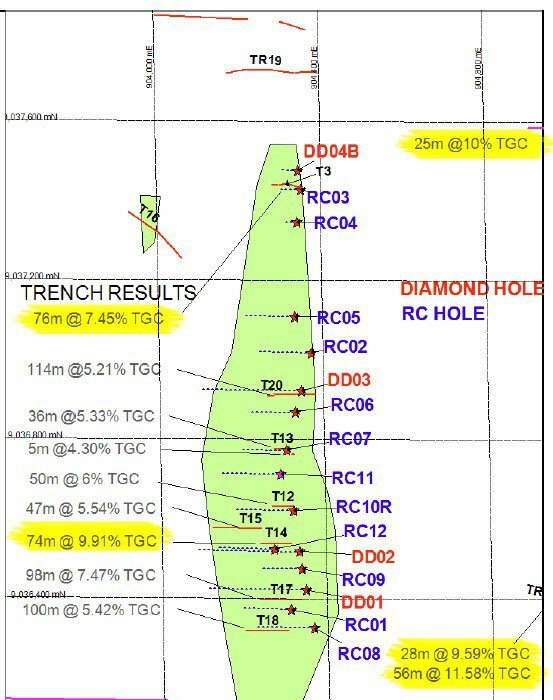 The previous two drill holes at Cascade hit 88m @ 9.68% TGC (Total Graphitic Carbon) and 60m @ 10.0% TGC – the full width of the lode is currently over 70m, however upcoming drilling may extend this further still. Meanwhile at Ulzani, cores from the first diamond holes intersected over 80m of graphitic mineralisation. Six to eight more drill holes are still to come at Ulzani – and BKT may be saving the most high impact drills to last – either way we will know over the coming weeks. Tanzania seems to be fertile ground for graphite explorers, with Magnis Resources (ASX:MNS) growing to a current market cap of $145M on the back of proving up its Tanzania graphite resource. Ongoing positive results and the imminence of further drilling have the potential to re-rate BKT into closer to its peers over the coming weeks. The Cascade prospect is newly discovered with only 4 reverse circulation (RC) holes drilled so far. Each one returned graphitic schist intervals with good visual graphite throughout. Most recent assay results indicate 88m @ 9.68% TGC including 44m @ 11.09% and 60m @10.00% TGC including 22m @ 11.46%. Assay results for the next two Cascade holes are expected any day now, as well as confirmation of a follow up drill programme starting. The Cascade prospect has the potential to be larger in size and higher in grade than the Epanko prospect, which BKT are looking to prove up as a JORC resource over the coming weeks. BKT has completed six holes at the Ulanzi prospect with another six to eight RC holes planned. The Ulzani Prospect is BKT’s most recent discovery so exploration is behind what’s happening at Epanko and Cascade. However, the results seen here have cause for optimism. BKT are currently examining a 3km strike length, which is expected to increase to the north and south as drilling continues. The 140 test pit samples examined so far have averaged over 11% TGC with a significant numbers of high grade (10%-30% TGC) samples spread-out across the prospect – a very heart-warming first result although it’s very early days here. Core from the first diamond hole at Ulanzi showing spectacular intergrowths of course graphite crystals. 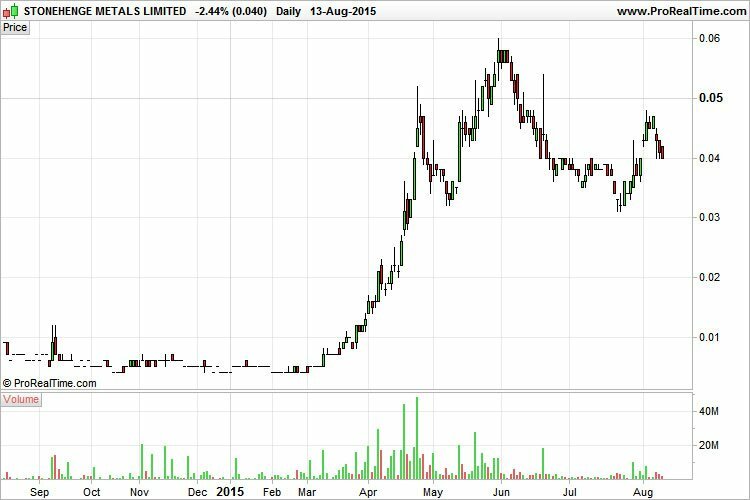 ASX graphite explorers, especially those in Tanzania, have been catching investors’ attention a lot lately. However BKT has been travelling somewhat under the radar. Meanwhile BKT’s direct neighbour has proven up a high grade 23.3 million tonne JORC resource (with a TGC content of 9.4%) – enough to capture the attention of German industrial giant ThyssenKrupp as a customer . At the same time, success is no guarantee here – BKT is a high risk stock and investors should seek professional advice before investing. SHE may be on the move again – for more details see our most recent article on the company: Energy Tech on the Cusp of Commercialisation? BKT has discovered more than 3km of graphite mineralisation at Epanko North and is busy proving this up to a JORC classified resource over the coming months. The graphite mineralisation BKT are discovering is likely along the same north-south trending lode structures of Kibaran’s 22.8Mt orebody. There has been over 1500m of trenching done here delivering strong results, and more assay results are on their way. We will know more about the true size of Epanko North over the coming months as the graphite mineralisation is firmed up. Graphite demand is expected to surge on the back of its applications in lithium-ion batteries – a market predicted to grow significantly over the coming years due to its use in electric cars and renewable energy storage batteries. A number of graphite explorers have grown rapidly on the back of proving up graphite resources, and notably in East Africa. BKT is actively exploring high potential graphite ground in Tanzania, yet remains somewhat below the radar compared to its peers. With drilling happening over the coming weeks, any strong drill hits have the potential to re-rate this stock. However, like all small minerals explorers, success is no guarantee for BKT – they may never define a commercial quantity of graphite. BKT is headed by an experienced management team, led by Mr. Stephen Copulos, owner of the ‘Copulos Group of Companies’, Australia’s second largest KFC franchise owner, who joined BKT’s board as Non-Executive Chairman in January 2015. Mr. Copulos is BKT’s major shareholder/financial supporter which given his 30 plus years in the mining industry, including his role as Chairman of Crusader Resources (ASX:CAS) gives BKT a strong backer. Although both are at an earlier stage, combined, Ulanzi and Cascade have over six times the mineralised footprint of Epanko North. Over the coming weeks, we could see official confirmation that two of its newest prospects (Cascade and Ulanzi) are even larger than Epanko. We will know a lot more details these two new prospects over the coming weeks as drilling results are released.